"Long ago, dragons were hunted to near extinction by the Order of St. George, a legendary society of dragon slayers. Hiding in human form and growing their numbers in secret, the dragons of Talon have become strong and cunning, and they're positioned to take over the world with humans none the wiser. Soldier Garret Xavier Sebastian has a mission to seek and destroy all dragons, and Talon's newest recruits in particular. But he cannot kill unless he is certain he has found his prey: and nothing is certain about Ember Hill. Faced with Ember's bravery, confidence and all-too-human desires, Garret begins to question everything that the Order has ingrained in him: and what he might be willing to give up to find the truth about dragons. " I cannot wait for this book! It sounds so good! It is Julie Kagawa and dragons all in one! Talon will be released on October 28, 2014. Oh yes! I actually read this one already but still can't wait to get a pretty finished copy! I am excited for this new kagawa world as well, hope you get to read it soon. You can never go wrong with dragons. Hopefully, this one will be good. YES ^^ definitely waiting on this one RIGHT along with you!! Although admittedly, I think the entire blogging community is waiting with us too haha XD This just sounds so good, I cannot wait to dig in! Awesome pick ^^ I hope you can get your hands on it a.s.a.p.! Great pick! I'm so excited for Talon also! 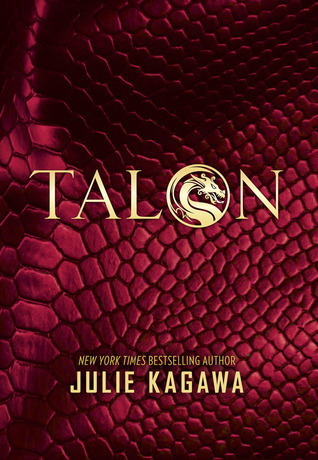 I really liked Kagawa's previous books and Talon sounds so amazing! I've been seeing this around a lot lately! Very cool cover. Thanks for sharing! !